Silent systems at an affordable price - That's only possible with Phobya! A fan which appeals to both low-noise enthusiasts and performance-oriented users: This is something completely new on the cooling sector. This and the many more features make the competition shake in fear: "Fear it!" The manufacturer consortium Phobya has achieved the exceptional compromise of not increasing noise emissions whilst improving airflow. This was made possible by adjusting fan blade angle and geometry as well as the implementation of many other design features. This fan is the future! A bearing which connects fan and frame with minimal flow resistance, a highly developed motor and rigid frame as well as special blade geometries: This is what low-noise enthusiasts know to appreciate. 17 dB(A) are a true pleasure, especially with the flow rate of 95 m³/h in mind. This fan is truly an improvement for any system! Of course even this fan is capable of even more quiet operation. The design allows it to run at lower voltages, with a starting voltage range of 7-12V it is possible to operate it at a virtually inaudible speed whilst still achieving plenty of airflow. 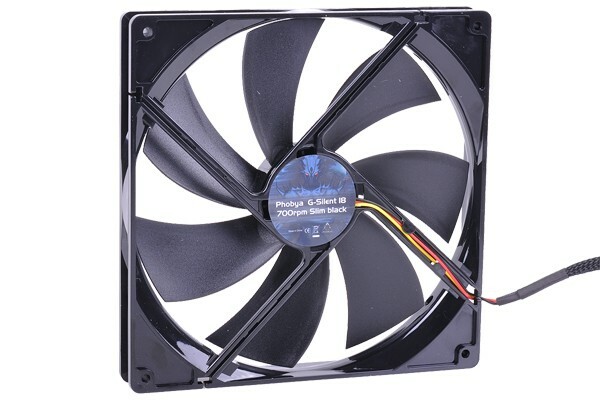 With a thickness of only 25mm the fan is only as thick as a standard 120mm fan! This gives many more possibilities for mounting in the enclosure, especially in combination with radiators. With this innovative new fan the many problems of 180mm fans are now a thing of the past!